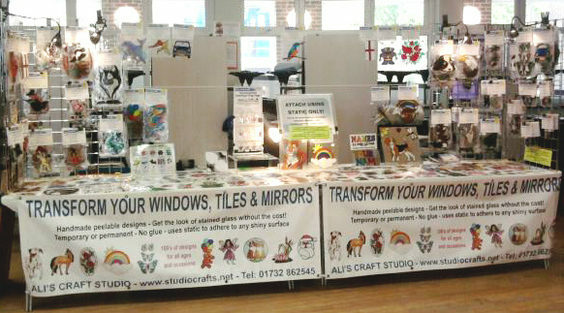 Ali's Craft Studio is a small family business run by myself, Alison Lloyd (Ali), in Kent - the beautiful 'Garden of England'. I don't have a shop but you can purchase at any time from this site or from our stall at craft fairs around the South of England as listed in the Fairs List I'm a very proud winner of the Theo Paphitis Small Business Award. I actually made my first window cling way back in 1996 but having a busy and time consuming full time job made it impossible to dedicate the time required to make them on a regular basis so my creating tended to be focused on Christmas decorations which I sold at one show a year. A particularly stressful time in 2007 made me realise that life is simply too short not to do something you love and in 2008 Ali's Craft Studio was born. I can now be found in my studio making new designs throughout the week and keep myself very busy at fairs most weekends. Do you actually make all the items? 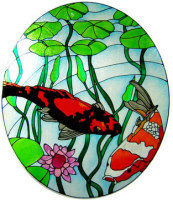 Yes - I have personally outlined and painted all the designs you see on this website. As handmade items, no two can be made the same - there will always be subtle differences so you know that your design is completely unique! As there is no pre-made aspect of these decorations, I can made adjustments to patterns and colours to really make something unique to you. Do you have anyone else working with you? Not on the creation of the designs but my wonderful husband, Phil, is my right (and left!) hand man at craft fairs so you are likely to see us both there working hard on the stall - so please do come over and say hello!